I wonder -- why is the spring semester the colder of the two when its name evokes warmth, and the fall semester the warmer when its name sounds cold? Classes are already over, and the weather hasn't even reached 100 yet. (Though, I'll admit, it has seemed to be cooler this year.) But when next semester starts, there will be two three months before I even think about donning a sweater again. So why will that be the "fall" semester? Curious. During my last couple weeks of this semester, I was busy writing. And writing. And procrastinating. Something good did come out of my procrastination, though. I've always loved "I Love Lucy," and I've been a fan of "Get Smart" for several years; I feel more loyal to older TV shows than new ones. Now I have discovered "I Dream of Jeannie." Not that I had never heard of the 1960's show: I just never watched more than one episode. But I found Seasons 2 and 3 on Hulu, and now I'm a fan. And then I realized it was high-time I opened up a Netflix account, which would allow me to go back to Season 1 and eventually 4 and 5. Now I'm hooked on Netflix. It is a strange thing, yes, that so soon after classes end (and my consequent rejoicing over not having to read for them anymore), I should move into my own reading, but that is the way of it, after all. 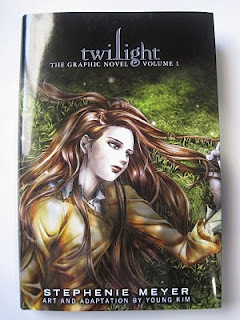 I started with Twilight: The Graphic Novel since that's half pictures, anyway. I've never read a graphic novel; I don't like any comics or cartoons much. The idea of a whole book in this format has always seemed, well, wasteful and perhaps (I mean no offense) immature. But I had never so much as picked one up, had I? It was my enduring support of Stephenie Meyer that led me to get this book, but I came out with some appreciation for the graphic novel format. I was amazed at how artistic it was. The colors, the positioning, the way that movement is implied. Everything on the page is formatted so as to render the tone visually. The blood-typing scene was one of my favorites: I was tempted to get woozy right along with Bella. My complaint, still, is that the dialogue has to be chopped up for length's sake; at certain points, it feels like vital things are left out. But I suppose this won't be a problem if, like me, the vast majority reading this book already have the original practically memorized. Today I finished my second summer read: Such a Pretty Girl by Laura Wiess. I read her Leftovers a few months ago, and praised its language and uniqueness, while not wholly enjoying the content (though the first two were enough, to me, to overpower this). Such a Pretty Girl I may have liked even more. Still a fresh read -- stylistically. Also some great themes: we see the mind of another teenager, Meredith this time, who is struggling to find her own power among people who have no care for her as an individual. Still a rather depressing read, but there is such empowerment in it that I think did add to myself. Thus begins my summer with better results than my expectations. Next up is Virginia Woolf's A Room of One's Own.